Seldom do I have the privilege of meeting, much less knowing, people I add to the Ecumenical Calendar of Saints’ Days and Holy Days. This time, however, I write about someone I not only knew but considered a friend. 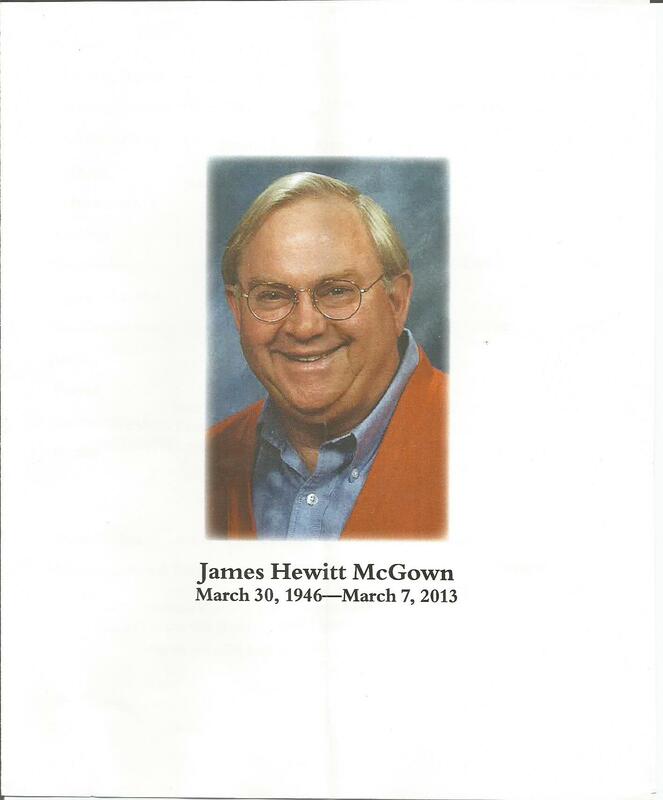 Jim McGown was born in Lynbrook, New York, in 1946, son of Hewitt Roe McGown and Jeanette McDougal McGown. He grew up in Garden City, on Long Island. Jim, a graduate of McGill University, Montreal, Quebec, came to Athens, Georgia, for the first time as a naval officer in training at the U.S. Navy Supply Corps School. During that stint he met Jane Foster, whom he eventually married in September 1972. They settled in Jane’s hometown, Athens, the following year, remaining there and moving into their most long-lasting home in 1987. Jim and Jane raised two sons—Evan Hewitt McGown and Todd Foster McGown Elihu. Their home was a site of much love, personal warmth, and generosity of spirit. Jim lived long enough to see Todd marry and welcome visits by his daughter-in-law, Baraka, and his granddaughter, Akasha. As Jane described Jim to me recently, “God’s love smiled through him.” Thus Jim loved Christ in his neighbors near to home and far away. He helped to found the Athens Area Homeless Shelter, served on the board of the Samaritan Counseling Center of Northeast Georgia, mentored community youth, taught computer classes, and lobbied for Palestinian rights. And Jim and Jane helped me on more than one occasion, even allowing me to live upstairs for a few weeks in 2007, when I was between long-term housing arrangements. Jim recommended good books to me, gave me some, and offered me sage advice. The last book he gave me—a Lenten guide which N. T. Wright wrote—has become an especially prized possession. Jim held various jobs over the years, including a position at Jane’s family business, Foster’s Jewelers. He also operated a business, Vintage Jim’s, and mentored many students at the Presbyterian Student Center near The University of Georgia (UGA). That was where I met him during an ecumenical excursion. His kind counsel helped me through some difficult periods in my life, especially UGA-related ones. Jim, raised a Roman Catholic—once even a member of a religious order—became a Presbyterian. He, a member of First Presbyterian Church, Athens, served there as an elder. He also attended General Assemblies of the Presbyterian Church (U.S.A.) as a delegate and mentored Education for Ministry (EFM) groups at St. Gregory the Great Episcopal Church, Athens. Jim, a warm-hearted man with an inquisitive mind, read scholarly books (especially ones about religious topics) and returned to UGA in his retirement, earning his M.A. in religion. He died after having attended a lecture on the university campus on March 7, 2013. It was appropriate that Jim’s final act was an academic one. Jim was a great man who left the world better than he found it.